This three hour self-paced e-learning course reviews the principles of Lean Construction as taught in AGC's Lean Construction Education Program. The course is designed to supplement learner's review and study of the curriculum's seven units as they prepare for the CM-Lean exam. Course participants can assess their understanding of Lean Construction as they experience the audio and visual content and answer the 55 review questions as they progress through the seven units of the CM-Lean Exam Prep Course. 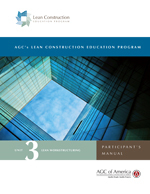 To access the CM-Lean Prep Course, please go to learning.agc.org and sign in using your AGC username and password. This Lean Construction 101 course serves as the introductory course to the AGC Lean Construction Education Program, and is the starting point for your Lean Construction journey. This 50 minute self-paced e-learning course provides a foundation of the key concepts and terms used in Lean Construction, providing you with the background necessary to further your Lean Construction Education. To access the Lean 101: Foundations of Lean Construction Course, please go to learning.agc.org and sign in using your AGC username and password to access the course.